Prunus Spinosa, also known as blackthorn or sloe is a wild relative of the cultivated plum. It is native to Europe, western Asia, and northwest Africa, and blackthorn because of its dark-colored bark and skin. It is a tree of profound British and Celtic magical traditions and is considered to be ‘Increaser of Secrets.’ In Celtic tree lorei, is reputed as a tree of ill omen. Blackthorn is a large thorny shrub tolerant of most soils. It works as an animal-proof or cattle-proof impenetrable hedging plant. This deciduous shrub with sharp edges can grow up to 3 or 3.6 meters. It should not be confused with P. cerasifera (cherry plum). The plant’s flowers and fruits can be used for medicinal purposes. In fact, they have astringent, antioxidant, diaphoretic (inducing perspiration), depurative (removal of impurities), febrifuge (reducing fever), laxative, stomachic, and diuretic properties. The flowers are creamy white in color and appear before the leaves. Coming to the fruits, they are bluish-black in color. They are about two centimeters in diameter and have a tart flavor. Interestingly, the juice of unripe fruits of this plant is used as a laundry mark. The sap from the bark of the tree, being a rich in tannins, is used to make an ink. Moreover, the branches of the plant can have entwined and interesting shapes. They are often used for making walking sticks. The plant is also makes a good fire wood as it burns slowly and emits little smoke. The ripe fruit, referred to as sloe, is used to make a liqueur called sloe gin. It can be taken as a post dinner liqueur. Besides, it can be mixed with vanilla ice cream, too. In addition, sloes can be used to make jams, jellies, syrups, and so on. Being extremely tart and astringent in taste, they are not eaten raw. They can be consumed after several frosts because freezing breaks down some of the sugars. Even the seeds of these fruits are edible, whether raw or cooked. Moreover, the dried fruits and leaves of this plant can be used to make herbal tea. Similarly, the edible flowers can be sugared or crystallized. The flowers, leaves and bark of prunus spinosa have depurative properties. In other words, they help in blood purification and detoxification to remove impurities from the body fluids. The flowers, in particular, are rich in rutin and quercitin that aid in purification of blood. It prevents gout and rheumatism as well. Prunus spinosa or blackthorn, improves digestion, relieves constipation, heals dyspepsia, reduces bloating, and cures diarrhea, especially in children. Furthermore, herbal tea prepared by steeping two teaspoons of dried blackthorn flowers in a cup of water stimulates appetite. Simply consuming blackthorn jam or marmalade cures indigestion or upset stomach. Flowers of prunus spinosa can be used to remove fluid retention, treat kidney stones and other kidney problems because of their diuretic properties. In addition, the herb is considered good for managing bladder spasms. It also helps relieves cramps in the stomach and nerve pain. The Complete German Commission E Monographs: Therapeutic Guide to Herbal Medicines has approved the use of this herb for getting rid of mild inflammation of mouth and pharyngeal mucosa. When dealing with sore throat, you can gargle with fresh juice extracted from ripe sloe berries. Furthermore, you may gargle with an infusion prepared from blackthorn leaves to heal inflamed tonsils. To prepare this infusion boil about four blackthorn leaves in 16 ounces of water for 10 minutes. Strain the solution. Gargle with it two to three times in a day. You can also make blackthorn blossom syrup by adding 450 g of white sugar and two handfuls of blackthorn blossoms in 4.5 liters of boiling water. When it cools, store the syrup in sterilized bottles. It can be mixed with warm water and used as a gargle to treat tonsillitis and laryngitis. You can add it in yogurt as well. Preparations containing flowers of prunus spinosa are considered useful for the treatment of ailments of the respiratory tract. Due to their expectorant properties, the flowers can fight common cold and cough. A decoction prepared from the bark of this tree can be taken to lower fever. The pulp of ripened sloe berries is combined with other ingredients to make commercially available astringent face masks to enhance your beauty. Besides, you can apply blackthorn extract on your skin to maintain skin elasticity for younger looking skin as it is rich in vitamin C and tannins. Application of blackthorn oil can prevent stretch marks. 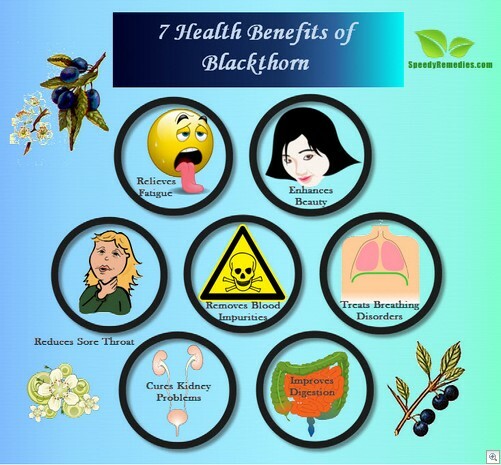 Drinking water infused with powdered blackthorn bark has a calming effect on the nerves. Thus, it helps relieve fatigue and boosts vitality. In addition, blackthorn extract mixed in tea or water is also useful in this regard. When dealing with issues like insomnia, shivers, lack of interest, etc. due to menopause, one can steep half a teaspoon of dried blackthorn flowers in a cup of boiling water for about five minutes. Strain and drink this herbal tonic when it cools. At times, the leaves and seeds of this plant may have hydrogen cyanide which is likely to give them a bitter taste. Though not harmful in small quantities, still you should avoid having the leaves and seeds containing this toxic substance. Besides, some individuals may be allergic to this herb. Pregnant and lactating women should consult their doctor before taking blackthorn or runus spinosa for medicinal purposes.